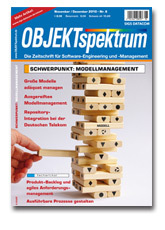 "Ausgereiftes Modellmanagement: Mehr als nur XML unter Versionskontrolle"
With the boom in modeling, everybody is trying to manage models with existing versioning tools and practices. And everybody is suffering: modelers, VCS vendors and modeling tool vendors alike. In this article we take a step back and look at what is actually needed for model management, and how a novel approach, designed from scratch for models rather than text, has fared in practice. We will examine what old problems of model, variant and version management it solves, and how. On the counter side we look at what new problems Domain-Specific Modeling Languages raise for model management, and how to address them. These results are based on and will be illustrated by examples from a variety of industries, including telecom, medical and finance. From these and other experiences over the last fifteen years, we will also see which ideas sound great in theory but don't work out in practice — and why. Thanks to the enlightened editors at OBJEKTspektrum, we can make this article available to you here. Please respect their copyright by not distributing the article or direct links to it: point others to this page instead. Slides from Mature Model Management talk by Steven Kelly at Code Generation 2011 (PDF, 2.6MB) ©2011 MetaCase.